Infinity swimming pool design and construction in Lafayette by Hawkins Pools team features infinity edge, taking advantage of the beautiful view from Lafayette hill area. The picture above shows the completed infinity swimming pool for our client in Lafayette. Contact Hawkins Pools for infinity pool design consultation for your home. Below is the picture of the infinity swimming pool project in Lafayette during construction. There are key elements to consider for infinity swimming pool design and its construction for your home, including who will use the pool, purpose or what the pool will be used for, your back yard condition (size, shape, grading, etc. ), pool size and shape desired, and special features or options. An infinity swimming pool design, also called infinity edge, negative edge, zero edge, infinity pool, disappearing edge, or vanishing edge swimming pool, is a swimming pool that has a visual effect of water extending to the horizon, vanishing, or extending to “infinity.” Such infinity swimming pool has water flows over one or more edges, creating that infinity effect. 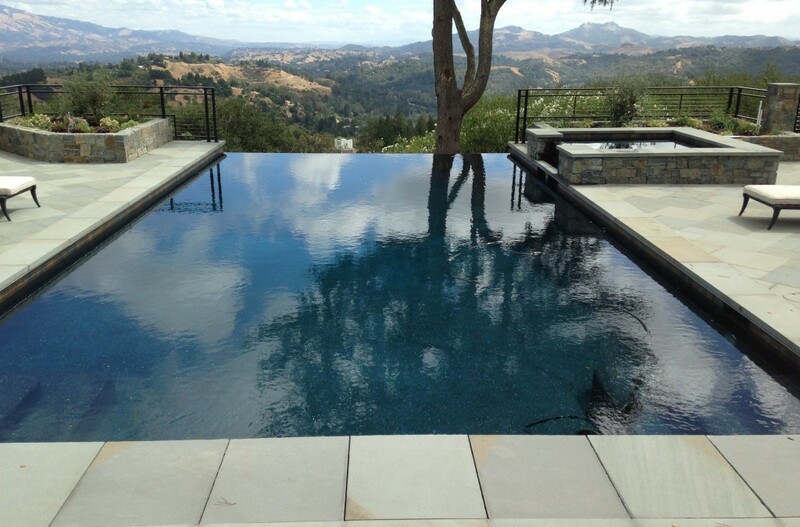 Certain location where the infinity swimming pool is constructed can provide impressive effect, especially where the infinity edge appears to merge with the sky, just like this one in Lafayette hill or other infinity swimming pools by Hawkins Pools in the hills of Danville, Alamo, Walnut Creek and San Ramon. Hawkins Pools was hired as a swimming pool contractor in Lafayette to design and construct pools that meet the needs of the home owners. As a reputable builder, Hawkins Pools offers expertise and design services that assist the home owner in Lafayette in considering the above design elements and making the right choices. Contact Hawkins Pools to get your own dream swimming pools and pavilions. Hawkins Pools design and construct swimming pools and back yards for clients in Lafayette, Danville, San Ramon, Alamo, Blackhawk and other Bay Area locations. See completed swimming pool projects by Hawkins Pools of San Ramon.